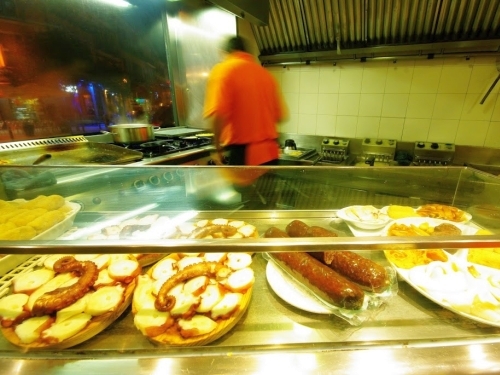 What goes into making a list like the top ten tapas bars in Madrid? Like any big city, it’s difficult to make a top ten for anything, let alone tapas. The below, with a couple of exceptions, reflects my personal bias for down-to-earth, affordable tapas (kind of the whole point, for me) served in venerable bars that have stood the test of time. The old, the new and the regional — you’ll find a few places you may not have heard of, and those familiar with the city will note the absence of some legendary spots that have, in my opinion, become victims of their own success. Nevertheless, a visit to any the following will guarantee an unforgettable culinary experience with Spain’s national food. I didn’t get his name, but the bartender in La Bodega de la Ardosa is that bartender: he’s the guy in the bowtie who will quietly polish a glass as you pour your heart out over a vermouth. He probably doesn’t even want to speak to you but he looks like he could save your marriage with a casual aside. Everything about this place has a powerful nostalgia to it but nothing comes across as kitsch. Dimly lit, the walls are lined with old wines and beers and grotesque antique prints along with a host of novelties to keep the eyes busy. Oh yes, the food. Not too much cooking going on here, but the canapé of goose liver paté with cranberries is not a canapé — it’s a mountain — and the empanada is especially good. They’re known for their salmorejo, a thick tomato soup laced with garlic and served chilled like its cousin, gazpacho. Although everything served here is simple and much of it cold, all is of the highest quality. A joy and a delight, go for the vermouth; go back for everything else. They don’t take kindly to photographers in La Venencia. According to the New York Times, it’s because the place was popular with Republican soldiers during Spain’s civil war and, photos being considered incriminating, the rule has never been relaxed. According to the owner I asked, they just find it annoying. Either way, it’s an irony because if ever there was a picture-perfect bar, it’s this one. We’ve all seen old taverns. Even the ones that aren’t fake often lean on the “old” schtick a little too heavily, but this sherry house on Calle Echegarary in the centre of Madrid is the real thing: a genuine cultural artifact. No evidence whatsoever of any attempt to redecorate since Hemingway had his last manzanilla here. Sparsely furnished and every inch of the bare walls heavily discolored with time and tobacco, the famous wine from Jerez is served from the barrel in five dry varieties. You won’t see a kitchen; they just slice things: cheese, jamón, mojama (cured tuna), chorizos and salchichones, all of it perfect with the wine. You might not even see a smile behind the bar and the ambiance is hushed, though when addressed, the gloomy looking owners turn out to be very gracious and proud of the place, and who could blame them? The high-ceilinged, humbly furnished taberna might just be the most beautiful bar I’ve ever seen. 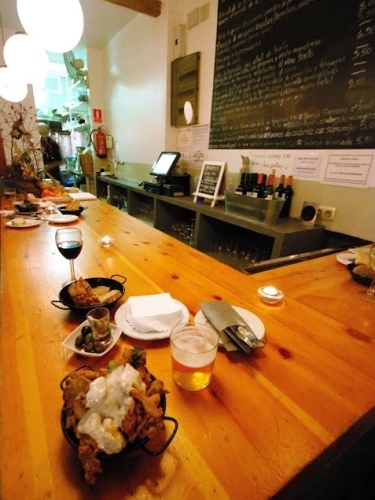 A corner taberna on one of the quieter streets in La Latina, Madrid’s renowned tapa district, there is nothing quiet about Almendro 13. This place is so popular there isn’t even any room for a bar and therefore nothing to lean against with your drink. Everyone sits. If you can’t find a seat, and you probably can’t, you wait. My puppy dog eyes must still be in working order because they find us a couple of stools in the service area, downstairs in the cellar room. Throughout our short meal we have to get out of the way or move a coat whenever the waiter wants another menu or place mat, but when our food arrives we know it’s been worth it: huevos rotos, a real madrileño dish and one that couldn’t be simpler. 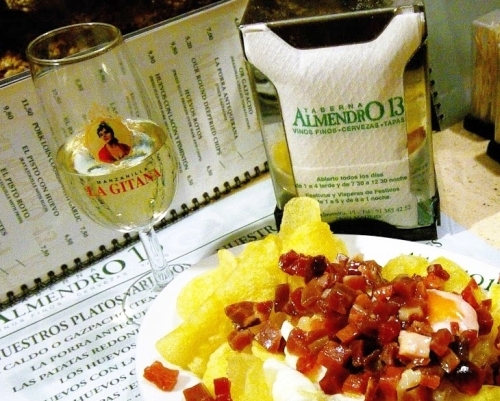 It consists of piles of wafer thin potato fries with a soft-boiled egg broken over them, topped with a heap of jamón taquitos (tasty little cubes of cured Spanish ham) — perfect with a glass of manzanilla on a tiny stool with a waiter leaning over you. 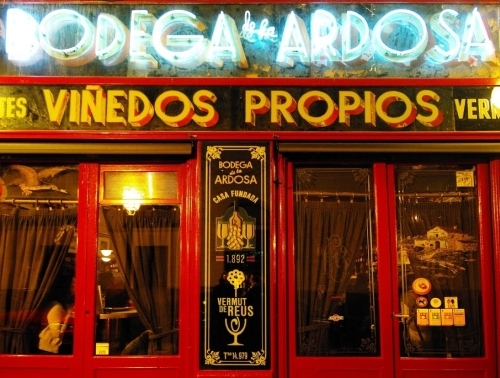 The place is informal, friendly and a bustling Madrid highlight. 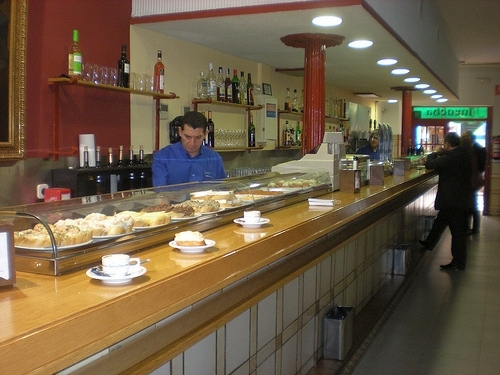 In centrally located neighborhood of La Latina, Restaurante Txirimiri is a relatively new addition to the tapas scene. At the center of Spain, Madrid is a city where all of the regional cuisines are showcased: Andalucia, Asturia, Valencia — you name it. 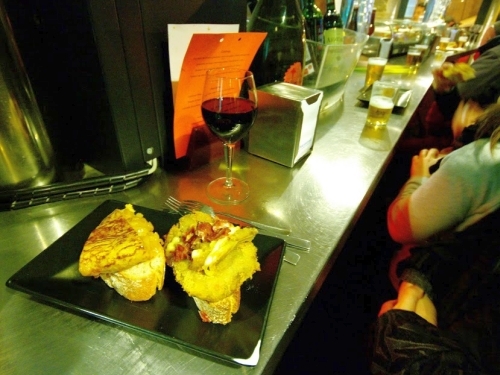 In Txirimiri’s case, it’s Basque food in the form of pinxtos — elaborate little snacks piled onto slices of bread. Well, some of them are elaborate — one of the nicest ones here is a simple slice of tortilla de patata, all gooey runniness and caramelized onion. Another is the pinxto of breaded mushrooms with jamón. There is a dining room at the back and a sit-down menu of quality beef, fish, ibericos and something called Bull’s Tail Bikini — a reason to go back if ever there was one. The overall impression is that of day-glo orange — it’s the colour of the polo shirts the staff (all men of a certain age who look as if they’ve really lived) wear and of the sauce they douse the potatoes with. The color is impossible to miss because the place is lit up like a fish and chip shop. The ambience is more takeaway than bar, but bar it is; the floor strewn with discarded paper napkins and the roar of the customers deafening. Patatas Bravas is eaten all over the country and is one of the few Spanish dishes that has real spice to it, but it isn’t just any old version that they serve at Las Bravas. Oh no, these people claim to have invented it, sometime back in the fifties, and there’s a patent on their product to back their claim up. They cook in a window overlooking the street in the Espoz y Mina branch (there are three outlets within a few streets of each other), so all is well on the hygiene front, apart from the floor. You can also have morcilla (blood sausage) or pulpo (octopus), but in a Catholic country, coming here and not trying the patatas is probably some kind of sin. Las Bravas: Calle Espoz y Mina, 13 and two more branches nearby. Jurucha has been opening its doors at 19, Calle Ayala, in Madrid’s upscale Salamanca district since 1961. That’s a long time, but it’s only going to take you a couple of seconds to decide whether you like the place or not. Not at all upscale, this is exactly the kind of Spanish bar that will have some of you turning around in the doorway, and no bad thing — at least the rest of us will have a tiny bit more room to squeeze into this long, crammed and uproariously noisy space. If none of this sounds appealing, don’t even bother, but if a bar that knows what it’s doing and does it well sounds good to you, don’t miss Jurucha. Quality ingredients and simple canapés prevail with an unexpected menu highlight I haven’t seen elsewhere: a hard-boiled egg croqueta. 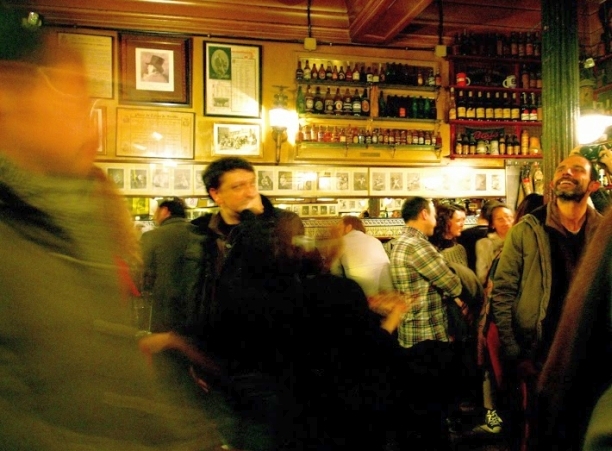 In the lively and gay-friendly Chueca area, Baco y Beto is another relative newcomer. The interior is sharp and there’s just enough light to get a good look at your food. Just as well because this is some good looking food. Presentation is important to the owners here; even your cutlery arrives in a neat little silver paper envelope. With raciones averaging at around the €11 mark and medias at around €6.50, lingering here will cost you a little more than it would in an old-school tapas joint, and aficionados of the traditional tapa scrum might find the atmosphere a little subdued. However, with interesting selections like breaded mushrooms in a truffle alioli and shredded lamb on a caramelized plantain cake on offer, Baco y Beta is a must-try for the foodies. The brainchild of chef Paco Roncero, Estado Puro is on a mission to share the traditional flavors of the Spanish tapas in new and exciting ways. Old favorites emerge from an avante garde kitchen in surprising forms: ensaladilla rusa, patatas ali oli, croquetas de jamón and so on. The first treat here though is visual. On Plaza Cánovas del Castillo and in a new branch on Plaza del Angel in the Huertas district, the bars are decked out in post-kitsch fabulousness. 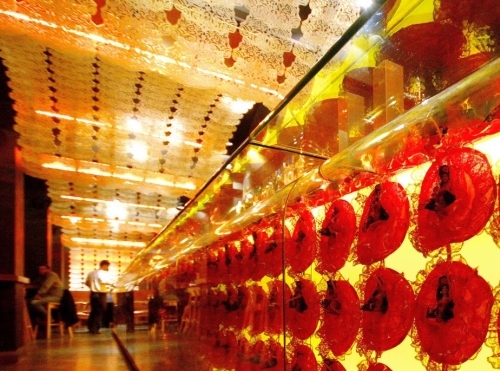 In Angel, plastic bailaora dolls stud the front of a bar that stretches away into a clattering orange take on the flamenco aesthetic. Estado Puro is all about celebrating Spanishness by reinventing it. It would be a very strange tapas joint indeed that couldn’t put a tortilla de patatas in front of its customers and Estado Puro is no exception. What is exceptional is the twist: their “21st Century Tortilla” comes in a glass. The trio of traditional tortilla elements are served up in a creamy, comforting concoction that replicates the flavors of the famous Spanish omelette in liquid form. 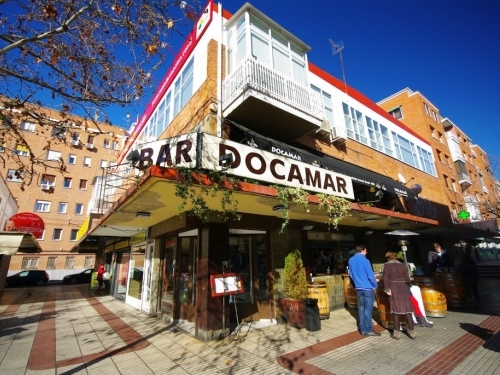 Docamar is slightly outside the center of Madrid, making it more of a neighborhood place, but still very reachable by bus or leisurely walk. Its appearance on this list makes patatas bravas the dish of the day because, as it is in Las Bravas, that’s the speciality here. It’s further down in the ranking because it doesn’t quite have the pedigree of its more central rival but there isn’t much between the two bars in terms of flavor — the truth is the potatoes are fried well in both and the bright orange, spicy sauce is very similar. Docamar will throw you a few for free when you order a drink, and with seating areas upstairs and down probably provides the more comfortable experience. My advice? Patatas bravas are always a good idea — so go with both. 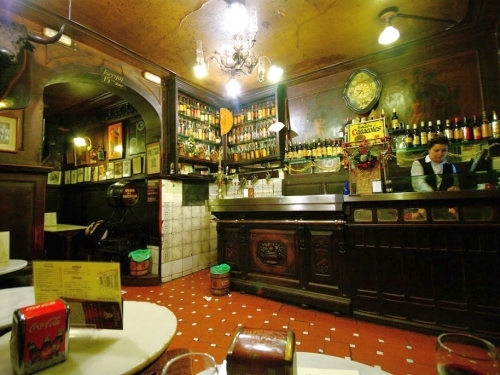 Maybe I’m too easily seduced by the antique, but Taberna Antonio Sánchez is my kind of bar. Hidden away in the gritty Lavapiés neighbourhood near the city center, everything from the façade out front to the dining room at the back speaks of a bygone age. I’m sure the kitchen is spotlessly clean these days but the owners have been careful to leave a layer of dust over the shelves of sherry bottles and bull’s heads (the bar is named for the original owner’s son, who died in a bullfight). 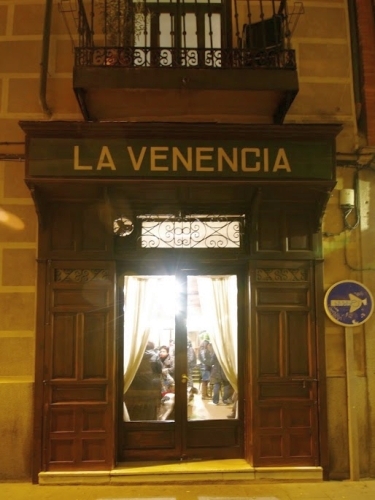 It’s the oldest in central Madrid, having opened in 1830, but the food is fresh and they specialise in snails, fried eggs, tripe and Olla Gitana, a gypsy stew. Robin Graham has written for In Madrid, The Expeditioner and the Matador Network. He regularly contributes to The Spain Scoop and blogs at the award-winning Alotofwind. Follow him on Twitter: @robinjgraham.